It is a popular semi liquid, semi thick south Indian dessert made with roasted vermicelli and milk and flavored with spices. It is an integral part of south Indian meals and its often served along with lunch or dinner. The use of saffron and cardamom in the preparation not only adds delicate and subtle flavor but it also adds preferable creamy color complimenting its creamy taste. Discover how easy it is to make semiya payasam with this recipe. Take a small pan and heat ghee in it. Roast cashew nuts until light brown and transfer them to a plate. Roast raisins until fluffy in same pan and transfer to a plate. In a heavy bottomed saucepan, boil milk over medium flame. When it comes to boil, reduce flame to low; add sugar and cardamom powder and stir well to dissolve sugar. Slowly add roasted vermicelli and stir continuously. Let mixture boil over medium flame. 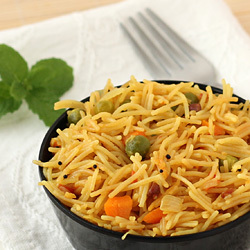 Cook until vermicelli becomes soft and mixture starts to thicken or for around 10-12 minutes. It will get thicker as it cools because vermicelli will keep absorbing milk. Hence, cook until semi liquid consistency. Add condensed milk and saffron strands; mix well and cook for 2-3 minutes. Taste for sugar and add more if required. Remove pan from a flame and transfer semiya payasam to a serving bowl. Garnish with roasted cashew nuts and raisins and serve warm or chilled. If you have raw (unroasted) vermicelli, then you can roast it in 1-2 tablespoons ghee until light brown over low flame or for around 4-5 minutes in a pan. If payasam turns thick after chilling, then add 1/2 cup warm milk and stir well to dilute. Serving Ideas: Serve it warm in a lunch as a sweet dish or cold as a dessert. During functions and occasions, it can be served as welcome dish. Awesome way of steps and very delicious everything. I like your web site very much. I am from Rajasthan so I like you every food.